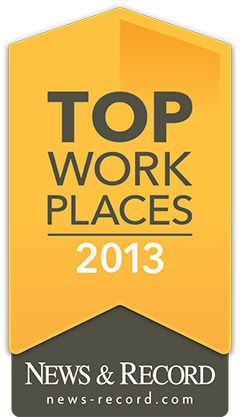 Advanced Home Care is pleased to announce that it has been selected as a News & Record Top Workplace. We were ranked fourth among large companies in the Triad. The Top Workplaces are determined based solely on employee feedback. The employee survey is conducted by WorkplaceDynamics, LLP, a leading research firm on organizational health and employee engagement. Advanced Home Care employees in the Triad completed a total of 587 surveys, representing 71% of the company’s Triad employees. Employees provided approximately 1000 comments and improvement ideas about Advanced Home Care. People stated that they felt their manager helped them learn, cared about their concerns, and make it easier for them to do their job well. Employees also said they felt AHC was going in the right direction and that their job makes them feel like they are part of something meaningful. “We are honored to have been selected for the award, particularly as the judges were our employees!” stated Joel Mills, Advanced Home Care CEO, when he heard the news. The News & Record published the complete list of Top Workplaces on October 20.